A few of you asked me about the little green seedlings growing, packed together, in a photo a few posts ago—they’re pea shoots. I’ve been growing them on my windowsill through the later part of this winter. I thought I’d share the process with you a bit. They are silly-easy to grow, whether you’re a city slicker or country kid, and quite pretty. It’s satisfying to have some sweet, tender greens right at your kitchen window to clip and toss into a salad or sandwich for some texture. The basics: Get some peas (there are certain varieties sold specifically for sprouting, but any variety sold for growing will do, really. I use an organic, dwarf grey sugar pea, which is known to be a nice salad green). Put them in some sort of container: a wide-mouth jar or glass bowl. Add water and let them soak for a few minutes. Then, rubberband some cheesecloth over the opening of the jar and drain out the water (it doesn’t need to be completely dry inside; a little damp is good). Set the jar on your windowsill. Do this every day for a few days—add water, drain through the cheesecloth, and allow to sit on the windowsill. After several days, the peas should start to sprout. Once they begin sprouting, all you need to do is spread them in a layer on a few inches of soil and keep them moist—they’ll do the rest. Normally you wouldn’t want seedlings to be so close together, but since you’ll be eating the seedlings, it’s okay. You can clip the peas when they’re more like sprouts, or wait longer (which I prefer) until they’re 4 or 5 inches tall, leafy and tendril-y. Sometimes they will continue to grow after you clip them, and you can get one or two rounds of shoots out of the original peas. My favorite way to enjoy them lately is quickly sautéed in a very hot skillet of garlicky oil, slightly seared, just barely wilting. After that, possibilities abound: on a piece of toast (with or without a smear of ricotta), stirred into warm lentils, or just on the side to add variety to a plate. It wasn’t until I tossed a tangle of them into the last seconds of cooking scrambled eggs, though, that things got spectacular. The violets are completely optional, but we have a million dotting the backyard right now, and I can’t resist snipping them to finish off most dishes—too pretty. Heat the oil and garlic in a skillet until very hot, but do not allow the garlic to brown. When the oil shimmers, add the pea shoots, and stir to coat with oil. Cook, stirring, for 2-3 minutes, until the shoots have wilted a bit and their leaves look a bit frizzled. Salt and pepper to taste. To add into scrambled eggs, remove the pea shoots from the skillet and set aside in a bowl. In the same skillet, make scrambled eggs your favorite way (I’m a low-and-slow kind of girl). Just before the eggs are cooked as much as you’d like them to be, stir in the pea shoots. Serve with crusty toast. I always reserve a few uncooked pea shoots to toss on at the end. Thanks so much for this post. This looks really great and I think I am going to try it. It seems like the kiddos would like watching the process, as well as watering and straining the little peas. I also want to mention how much I love your blog. It is really very beautiful and inspiring. The violets are so beautiful with the eggs! Looks like a perfect meal. Beautiful post. Thanks for sharing this. I don’t exactly have a green thumb, but I think I could do this :) The flowers are lovely, as is that breakfast. Can I join? I had a box of pea shoots lingering in my vegetable drawer, waiting for me to make something of them. Then, I woke up to this tweet recipe and wah-lah. Superb breakfast = day made. Thank you! My favorite kind of comment, Caty. So glad it worked out for you. What a wonderful little project! I might have to get started on this right away. I could use more greens in my life, and the whole business of starting a garden out back is moving pretty slowly. Thanks for sharing, Sarah. So pretty! So going to do this! Have you ever grown borage? I love the little blue borage flowers. I love your posts and photos! I have not! Sounds gorgeous; I will look into it. Hi Oana—these were grown in a south-facing window, which is not direct sunlight. It does get stronger sunlight during the later part of the day though. Honestly, peas are so easy—I really think any windowsill could work. I found your blog a few days ago through Heidi’s link over on 101cookbooks, and I gotta say, your posts haven’t let me down yet. The grapefruit olive oil cake she linked to turned out to be just what I was looking for. Your post about the climate surrounding food in our culture voiced many of the same concerns I have about the current food craze, and with humor. Then today I check back, and suddenly here’s a post about sprouts. I’ve been meaning to go out and get planting, and your post was the final push that did it. Tomorrow morning, here’s to me triumphantly buying a packet of pea sprouts (what sprightly, springlike syllables). Thanks for this. What a sweet note, Stephanie. Thank you; I so appreicate it. What a gorgeous post. I’m completely rubbish at growing anything in my garden (I have a pot of rosemary outside the back door – even though it’s s close I keep forgetting to water it! ), but maybe if I can keep these on my windowsill they’ll fare better…? Love the idea of stirring through scrambled egg : so simple yet so delicious. Luckily rosemary doesn’t need much water :) You can do it! I promise. Super simple. And a short life span! This is a wonderful idea. I hadn’t thought of growing pea shoots indoors. Beautiful! Love these, Will do Peas soon and post picture!!!! ha,ha…. So pretty! I love pea shoots on eggs in the spring, and the violets are a nice touch. Oh…this sounds wonderful, Kat…Thank you! Beautiful. Just added ‘dwarf gray sugar peas’ to my shopping list. Thank you! Any pea for cultivation will do! But I do like these grey sugars. Thank You! How beautiful is this website! I especially love this tip as it is difficult to find organic pea shoots and they don’t keep well refridgerated…..Many Thanks! So lovely. I love stir-frying the larger pea shoots I get from the Asian market, but sprouting my own on a windowsill would be even better. Gosh I want to garden!. But our youngest furry baby is a professional digger. She will proudly carry my herbs…her finds…around with her. Rosemary, thyme, basil and chocolate mint seem to be her favorites. I do however need to go get some sunflower seeds for sprouts. Have you ever tried them? I love them! Last time I bought some I finished munching my purchase before I returned home! Ooops. I had been thinking about them for the last week or so and since this is the second talk I’ve heard today of sprouts I guess it’s time to get them going! Aren’t pea shoots great? They’re everywhere at our farmer’s market lately. I definitely agree that they’re excellent stir-fried with garlic! I just bought peas today to sprout after I read about your sprouts yesterday. I would love to be able to garden but don’t even have a balcony, so I’m restricted to windwowsill gardening (indoors and outdoors). This sounds just perfect for me. Thank you for sharing. How did I miss this post! I love this idea! I just recently sprouted mung beans and have been looking for more ways to do some indoor growing. Love this! I cannot resist the sweet charm of the pea tendrils I’ve been seeing at my farmers’ market. I usually eat them out of hand or put them into salads; they’re so good. But the possibility of having them growing on my kitchen counter has a sweet charm of its own. Can’t wait to try! Yum! All of my peas starts are slated for outside, but I might just have to plant more to have around for the shoots. I would love to have some in my kitchen window! Thank you for this! I sprout a lot but wanted to do pea shoots. Now I have the gusto to do so! Thanks again. You received a Versatile Blogger Award! I am so excited to try this, I’m pinning it for everyone else to see too! Thank you. Beautiful! What plant is that on the window sill next to the sprouting peas? Anjali, you get a gold medal if you can tell me. It’s a little succulent that I picked up and—one of my biggest pet peeves—it was just marked, “Succulent.” It’s like calling all non-conventional tomatoes “heirloom,” it bothers the heck outta me. I’ve literally spent hours (both online and in my plant ID books) trying to figure out what it is. Does anyone know? We lived as American expats for several years in Taiwan in the 1980’s. Every February, the entire country went mad when pea shoots were suddenly available in the markets. Pronounced “doe-mee-ow” in Mandarin, the shoots – probably a week older than your sprouts – were quickly stir-fried with a lot of garlic and a teeny splash of oil and soy sauce. Whenever we happen to find pea shoots in our travels (more often these days!) I always buy a bunch and recreate our Taipei days. Thank you for this post. It brought back a lot of memories. yes, yes, yes. If I could have woken up this morning and filled out the mad libs to HOW DO I ___________, it would have been, make pea shoots out of peas. Fantastique!!! 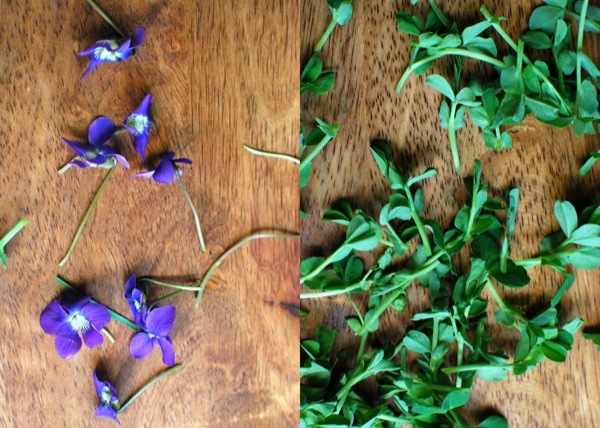 Very french…..violet and sweet pea snippets! Your photography and recipes are superb! KUDOS, for a job well done. PS……Sweet little “hunkaroo” you have now. Please give him a gentle squeeze and sweet kiss on the cheek….from auntie . I would love to try this but my cats eat everything I grow indoors! Hi, there! These pea shoots look delicious! We got some in our CSA this year and I fell in love. :) I was wondering, though, after you drain the pea seeds with the cheescloth, do you remove the cheesecloth before you let the peas set in the window sill, or do you leave the cloth over top of them? I’ve never grown indoors before, so I’m very new to this.. :) Any help would be appreciated! Thanks! Do you recommend changing the soil between batches of shoots? All of your ideas for using pea shoots look and sound delicious! Lucky you, having a yard dotted with violets~I love violets. Thanks for sharing! Hello, have you ever experience the seeds going mouldy before they produce any shoots? Mine really started to smell funny … Oops. Could they be getting to much water? It’s my second go and they’ve done the same thing. Oh dear! Oh and also, what is that lovely plant you have next to your pea shoots? Yes, I think this can happen. The rinsing and draining well is important to prevent this, but perhaps if you live in a high-humidity area or your house is damp, I can definitely see this happening. The seeds should start sprouting pretty quickly, so if you’ve gone awhile with keeping them wet and there are still no shoots and they smell funny, I would start over. So sorry! The plant next to the shoots on the windowsill is a funny little succulent whose name I don’t know :) The yellow flowers in the vase are forsythia branches. Something people use marrowfat peas to grow pea shoots instead of snap peas. Do they taste Different? Also, after the peas grow up to a few inches, do the original peas still Exist? Thank you for your posting. You are currently reading Garlicky pea shoots at The Yellow House.